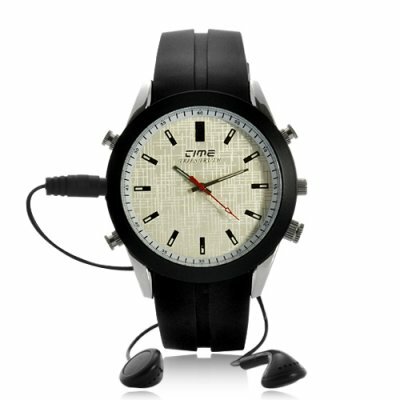 Successfully Added HD Camera Watch with MP3 Player (4GB) to your Shopping Cart. HD Camera Watch with MP3 Player (4GB): in high definition while listening to music! This comfortable-to-wear watch has a stylish and fashionable appearance. It has been designed to match with all today’s clothes and accessories; it is the perfect timepiece to be worn every day. There is no better cover to ensure that its main function is not discovered by people. Yes, besides being a gadget displaying temporal data (time), this elegant watch is also a high definition camera! A high resolution lens and microphone are ideally located within the watch face to let you inconspicuously record hours of secret files. This great HD camera watch is very easy to use with its tiny LED indicator showing you continuously which mode is ON. There are actually 3 recording modes: take high definition video, capture detailed photo or record clear sound. Switch between them with a simple press to adapt to the situation. Take a quick snapshot of the contract on the desk of your supplier or, if what interests you is what people are saying, record only their conversation. In this way you save storage space and make sure to have enough free memory to videotape the lap dancer you will watch tonight. This multifunctional watch comes with a built-in MP3 player! You read that correct, this ingenious gadget saves audio files in MP3 format and also plays them! Great for your audio playback, or just transfer your songs into the clock through USB, set it on music mode and then listen to your favorite music. After successfully performing secret agent missions, what is better than relaxing with harmonious music notes? And the clock has an internal memory of 4GB, which means plenty of space for videos, images, discussions and songs. This elegant HD Camera Watch with MP3 Player is suitable for amateurs, professional investigators and citizen journalists. It is in stock right now and brought to you at an unbeatable price by the online leader of devices and electronics, Chinavasion. Record both conveniently and secretly!